It is with a sense of relief I say, “Farewell,” to the previous lunar cycle. Perhaps you feel the same. Mercury has turned direct, we weathered the cresting waves of the eclipse season, and we’ve navigated Virgo expectations on top of it all. That was a lot. Those Virgo ideals of improvement and devotion haven’t gone away but perhaps we can ease into them with Libra’s balanced perspective, remembering that everything can happen in its own good time with beauty and grace. That would be nice. No, we’ve got plenty of Virgo influence for the next lunar cycle. And before I offend all the wonderful Virgos out there, I want to explain what this means. Virgos notice things. Like all mutable signs (Gemini, Sagittarius, and Pisces), Virgos are sensing, learning, and integrating constantly. As the earthy mutable sign, Virgos have to contend with matter and are driven to employ pragmatic solutions to problems. Even the Virgos whose heads are in the intricate worlds of fantasy game-playing or alternative modalities of healing are basically grounded into the value of what works versus what we wished worked. We need these doers and solvers. But we also need to learn to let go of unrealistic expectations for perfection—a worthy goal for this lunar cycle, as it was for the previous one. Virgo influence is large because the big guy—Jupiter—is transiting through Virgo until September 2016. This month, Jupiter is joined by Venus (in Virgo until November 9) and Mars (in Virgo until November 12). These three planets are giving a great show in the pre-dawn skies this month. Check it out. On October 17, Mars conjoins Jupiter. On October 25, it is Venus’ turn. On November 2 Venus and Mars come together. These three planets will energize Virgo ideals, which means we all get a chance to put our lives in order and deal with the demon of perfectionism. This applies to all the realms: physical, mental, and spiritual. With Mercury moving direct, perhaps there will be less disruption to putting these plans in place. It will feel good to get back on track. 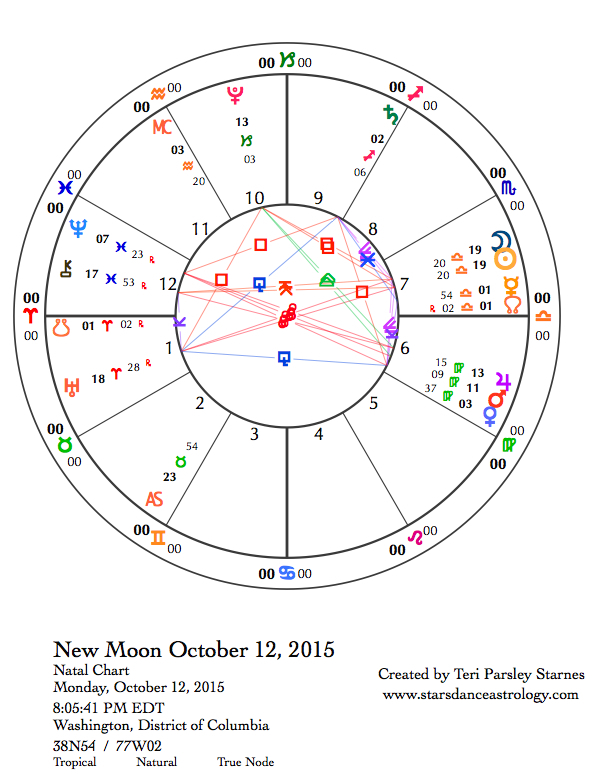 October 12—New Moon: Dreaming. With a sense of getting a fresh, new start, let’s rededicate ourselves to finding that perfect synthesis of Virgo pragmatism with Libran grace. It’s possible, right? I recently read a wonderful article about being happy on the science blog, Barking Up the Wrong Tree. With this New Moon in Libra, which is still heavily influenced by Jupiter, Mars, and Venus in Virgo, we have an opportunity to set intention around this practice of making “good enough” decisions. I wonder how we could shift the inertia and despair of changing the world if we learned to let go of being perfect. 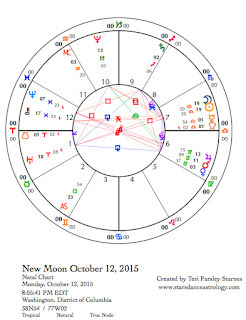 The New Moon chart shows the Sun and Moon in Libra (cardinal air) opposing Uranus in Aries (cardinal fire). Although this may be a less stressful lunar cycle than the last one, this signature does not let us off the hook. We still feel the need to wake up and act. The balancing act of this opposition is to find momentum for change while at the same time keeping a sense of balance and harmony. This is a good challenge to have. The promise is to find a sustainable amount of beauty, balance, and delight in our lives as we keep pushing the edges of change. Tuesday, October 13. A desire for efficiency and effectiveness rules the day. An ongoing trine between Jupiter in Virgo (mutable earth) and Pluto in Capricorn (cardinal earth), which has been in effect the last few days, gives strength and energy to our work. A favorable aspect between Mercury in Libra (cardinal air) and Saturn in Sagittarius (mutable fire) supports communication and discovery. We begin to really sense that Mercury systems are coming back online. When the Moon moves into Scorpio (fixed water) later today, we remember that the veils between the worlds are thinning. Give yourself time to tune into deeper connections. Tonight, set intention to dream. Tomorrow’s early morning aspects are favorable to receiving insight from our dreams. Wednesday, October 14. The Moon in Scorpio (fixed water) makes favorable aspects to Venus and Neptune while most of us in the U.S. are sleeping. These aspects encourage potent dream messages. Scorpio attunes us to the ancestral realms. We reconnect the worlds of the living and the dead during the late fall when the veils thin. As the Moon makes more favorable contacts this afternoon and early evening with Mars, Pluto, and Jupiter, the focus turns to receiving information about pragmatic magic. This is a good day to practice hearth magic such as preparing homemade foods, tinctures, or teas infused with healing intention. Remember the mantra of “Good enough.” Set an intention to live in wholeness. Thursday, October 15. This third day of Moon in Scorpio (fixed water) could be the dreamiest of all. Or, it could be the day when the damn breaks and we find a reason to move forward with much-needed transformation. The Moon is void-of-course all day, which could lead us into lowered defenses and a sense that not much will happen today. However, Mars in Virgo (mutable earth) and Pluto in Capricorn (cardinal earth) form a trine aspect that could be anything but mellow. Both Mars and Pluto co-rule Scorpio presenting us with the possibility that if we’ve been neglecting our true desires, we will wake up strongly to what we most want. Right now. It could be terribly exciting. October 16—Crescent Moon: Beginning. The sky is brilliant right now. In the pre-dawn sky we can see four planets: Mercury near the horizon will be the hardiest to see, but Mars, Jupiter and Venus are tightly clustered a good distance from the horizon. In the evening sky, look for the crescent Moon with Saturn nearby. It is wonderful when the visible sky tells the story of the moment. This story is influenced by the determined and optimistic energies of the Crescent Moon along with the beauty and wonder of these planetary meetings. There is a little something for everyone in this line-up of aspects today. The Moon and Saturn in Sagittarius (mutable fire) is determined in the search for meaning. Venus, Mars, and Jupiter in Virgo (mutable earth) are inspiring our efforts towards finding wholeness in all parts of our lives. Each lunar cycle offers a chance to set intention and follow the ensuing journey with mindfulness—curious and non-judging attention. What are you noticing about your heart’s desire? What are you noticing about holding a non-judging attention towards that desire? We have the opportunity to practice self-forgiveness today. Our desires may shine like the stars but we have to accept that we are human and fallible too. A t-square aspect pattern—with Venus in Virgo opposite Neptune in Pisces (mutable water), both square the Moon—could bring confusion, a desire to tune out, or overwhelming emotion. Honor the tide of feelings. They are important too. Saturday, October 17. Astrology teaches me to value our differences. The sky is a circle of wholeness. Each sign of the zodiac is part of that wholeness, just like every type of individual is a part of our wholeness. The contrast today comes from the square between the Moon in Sagittarius (mutable fire) with the conjunction of Mars and Jupiter in Virgo (mutable earth). How do you learn? What is your truth? The Moon in Sagittarius focuses on the big picture. This sign is the generalizer. The one who learns through expressing freedom. The one who knows we are greater than the sum of our parts. Mars and Jupiter in Virgo give tremendous energy to those who learn by processing, whose truth is pragmatic and useful. Virgo’s god is in the details. Sag’s god is in the sky. Big picture. Small parts. We need it all. Sunday, October 18. If you’ve read along with each day’s forecasts this week, you may have noticed a distinct emphasis on Virgo influences even though this is a Libra-inspired lunar cycle. We remember the Libra influence today when the Moon enters Capricorn (cardinal earth). We are making structural changes in our lives. A part of us is called to leadership in making those changes happen. Libra reminds us to approach this work collaboratively. Libra’s focus is on fairness and balance. Those qualities are important as we strive to bring idealism into focus.